Nomination Classic Composable Gold Animals Welsh Dragon Charm. Have fun creating your Nomination modular bracelet. Choose the links you like the best and give life to a unique piece of jewellery. 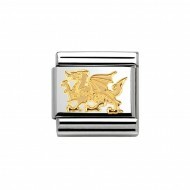 Nomination Classic Composable Gold Animals Welsh Dragon Charm, a stainless steel base link with 18ct Gold. ComposableNomination Classic Gold Animals Bear Charm, a stainless steel base link with 18ct Gold. Composable Nomination Classic Gold Animals Butterfly Charm, a stainless steel base link with 18ct Gold. Composable Nomination Classic Gold Animals Cat Charm, a stainless steel base link with 18ct Gold. Composable Nomination Classic Gold Animals Cats Charm, a stainless steel base link with 18ct Gold. Composable Nomination Classic Gold Animals Dog Charm, a stainless steel base link with 18ct Gold. Composable Nomination Classic Gold Animals Dolphin Charm, a stainless steel base link with 18ct Gold. Composable Nomination Classic Gold Animals Duck Charm, a stainless steel base link with 18ct Gold. Composable Nomination Classic Gold Animals Eagle Charm, a stainless steel base link with 18ct Gold. Composable Nomination Classic Gold Animals Elephant Charm, a stainless steel base link with 18ct Gold. Composable Nomination Classic Gold Animals Elephant Head Charm, a stainless steel base link with 18ct Gold. Composable Nomination Classic Gold Animals Fish Bone Charm, a stainless steel base link with 18ct Gold. Composable Nomination Classic Gold Animals Fish Charm, a stainless steel base link with 18ct Gold. Composable Nomination Classic Gold Animals Frog Charm, a stainless steel base link with 18ct Gold. Composable Nomination Classic Gold Animals Hippopotamus Charm, a stainless steel base link with 18ct Gold. Composable Nomination Classic Gold Animals Horse Charm, a stainless steel base link with 18ct Gold. Composable Nomination Classic Gold Animals Horses Head Charm, a stainless steel base link with 18ct Gold. Composable Nomination Classic Gold Animals Kangaroo Charm, a stainless steel base link with 18ct Gold. Composable Nomination Classic Gold Animals Koala Charm, a stainless steel base link with 18ct Gold. Composable Nomination Classic Gold Animals Ladybug Lady Bird Charm, a stainless steel base link with 18ct Gold. Composable Nomination Classic Gold Animals Mouse Charm, a stainless steel base link with 18ct Gold. Composable Nomination Classic Gold Animals Octopus Charm, a stainless steel base link with 18ct Gold. Composable Nomination Classic Gold Animals Owl Charm, a stainless steel base link with 18ct Gold. Composable Nomination Classic Gold Animals Rabbit Charm, a stainless steel base link with 18ct Gold. Composable Nomination Classic Gold Animals Rhinoceros Charm, a stainless steel base link with 18ct Gold. Composable Nomination Classic Gold Animals Sea Horse Charm, a stainless steel base link with 18ct Gold. Composable Nomination Classic Gold Animals Shark Charm, a stainless steel base link with 18ct Gold. Composable Nomination Classic Gold Animals Snake Charm, a stainless steel base link with 18ct Gold. Composable Nomination Classic Gold Animals Squirrel Charm, a stainless steel base link with 18ct Gold. Composable Nomination Classic Gold Animals Star Fish Charm, a stainless steel base link with 18ct Gold. Composable Nomination Classic Gold Animals Turtle Charm, a stainless steel base link with 18ct Gold. ComposableNomination Classic Gold Animals Whale Charm, a stainless steel base link with 18ct Gold.